Christmas is only days away (from the time I’m writing this) and the holidays are a great way to spend time with the family. Here at Niagara Inflatables we love treats, so we’ve come up with a list of 5 Simple Christmas Treats that you can make at home that look and taste great too! We’ve also compiled this list to be quite economical as many share similar ingredients. Enjoy! Back in October for our A Nightmare on 33 Elm Street event, we made a similar treat that looked like zombie fingers. 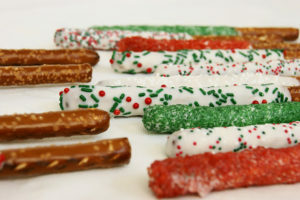 To make the pretzels more festive, dip some pretzel rods into some melted white chocolate. I melt chocolate wafers in a coffee mug in the microwave. And before they cool sprinkle on various holiday coloured sprinkles. Then let them dry on some parchment paper. Voila! Instant holiday snack. View the detailed recipie here. While you are picking up your White Chocolate Candy Melts, you can also get some regular chocolate candy melts. With the same process, melt the chocolate and dip a marshmallow on a stick to cover it completely. Use the back of a spoon to smooth it out. 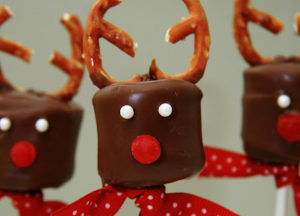 While still liquid, add the broken pretzel rings as antlers and stick in eyes and nose. Leave to dry by sticking into a foam block. These reindeer pops are adorable and are made even cuter when you tie a ribbon as a collar. Find the full Reindeer Pop Recipe here. Everyone loves popcorn and it’s an inexpensive treat. Christmasize it by making covering it with caramel flavouring and Christmas colours. Even though this is a fairly inexpensive treat, there are quite a few steps to making it. I would suggest making it into a large amount and then storing it in air tight containers so that you can snack on this all season long or give it freshly wrapped in clear cellophane bags as gifts. 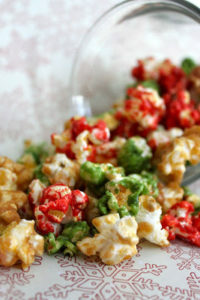 Get the Caramel Popcorn Recipe and ingredient list here. Need a lot of popcorn for an event? Rent a commercial popcorn machine and other fun foods from Ontario’s #1 event rental service. Make another treat using the same ingredients as treats 2 and 3. Using popcorn, marshmallows and sticks, you can make a crunchy corn pop. This one is sure to get sticky and messy. Kids will love it. 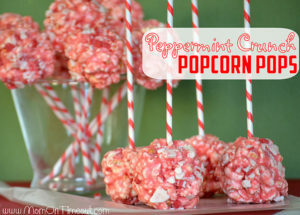 By mixing melted marshmallows, popcorn and flavours by hand into balls, this one make a yummy sticky treat. All you need to add is some butter and flavoured (peppermint) baking chips. Here is the detailed recipe card. Make this with your gingerbread house and use it as tiny trees on the lawn and make some extra for some ice cream afterwards. 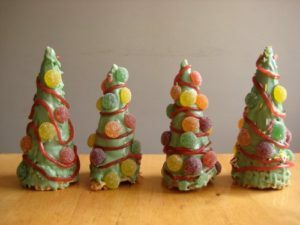 Add green food colouring to your gingerbread house icing sugar and then pipe it onto your waffle or standard ice cream cones. Use your candies to dress as ornaments and dazzle. If you make a few, you can turn your trees upside down and add a scoop of ice cream. Those are our Top 5 Super Simple Christmas Treats for Kids. What do you think of them? Which ones are you going to make? Take a photo and share it with us on Facebook, Twitter or Instagram.